Get a FREE Belt Pack! 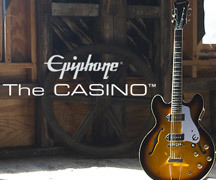 Throughout December 2018, buy one of the following Epiphone Player Packs from any participating Authorized Epiphone Retailer and receive a FREE Belt Pack. Throughout December 2018, enter to win a new Epiphone Slash “AFD” Les Paul Performance Pack, the ultimate all-in-one performance pack for beginners designed by Slash of Guns N’ Roses! A winner from the U.S., Canada, and the UK/EU will be chosen January 2, 2019. Bentonia, Mississippi native and longtime Epiphone artist Jimmy "Duck" Holmes visited Epiphone Headquarters in Nashville last week to get some minor repair work on his prized Masterbilt EF-500R. A magical mystery tour through the "greatest studio in the world"
Epiphone introduces the new Les Paul Special VE™ and SG-Special VE™ (Vintage Edition) electric guitars featuring the historic Les Paul and SG profile made with a lightweight Poplar body and powered by Epiphone open-coil humbuckers with Ceramic-8 magnets. Now at a price anyone can afford!